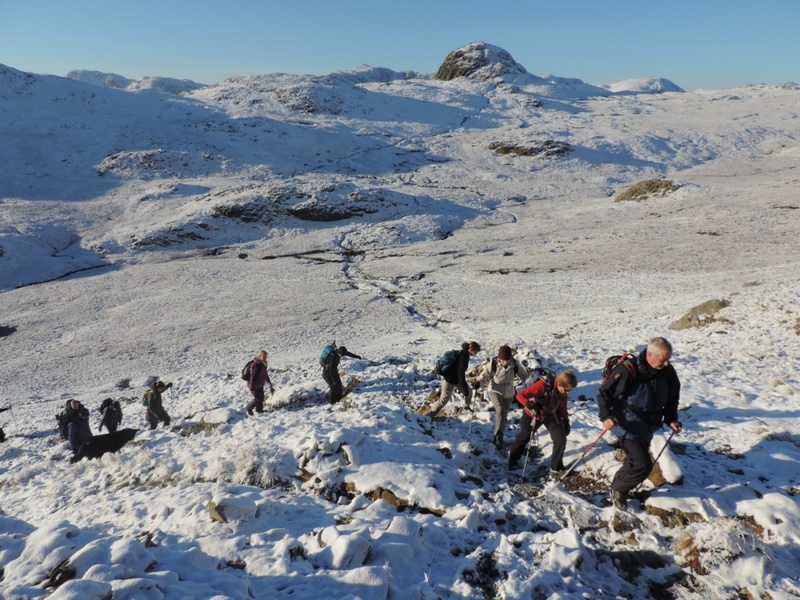 This year’s Twixmas Winter Walking holiday 27-30 December 2018 will be based from Keswick in the Lake District, Cumbria. 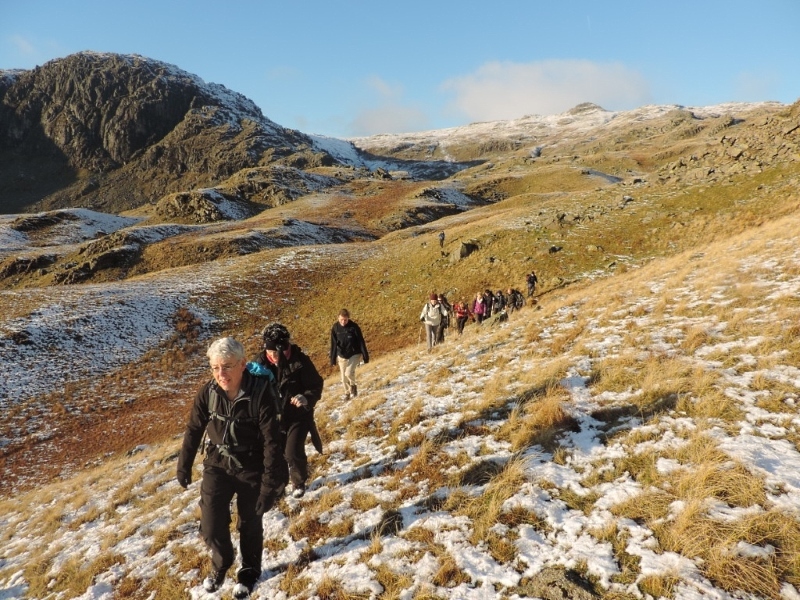 With access to so many great Lakeland walks, Keswick offers one of the best locations for some memorable winter walking and a variety of places to eat and drink in the town for enjoying group social evenings. YHA Keswick, situated in a quiet area but within 5 minutes of Keswick town centre, offers an unbeatable location overlooking the River Greta and Fitz Park, with far reaching views to Latrigg and Skiddaw. YHA Keswick is a stunning, recently refurbished Lakeland hostel. The hostel also features a brand new Riverside Bar and Restaurant. Accommodation is for 3 nights, including breakfast, in shared male and shared female bunkrooms. Private rooms are subject to availability please contact us before booking. If you prefer to find your own accommodation, please click on the ‘Trip Notes’ tab for alternative accommodation suggestions. Guests can check in to YHA Keswick from 3pm and the holiday will start at 8.30pm with a welcome introduction at YHA Keswick. It’s a chance for everyone on the Twixmas walking holiday to meet and the Country Adventures tour leader will be on hand to answer any questions about the planned walks. In the evening, an optional social evening is planned in Keswick, where the group can meet up for a drink and enjoy an evening meal together. It may be possible to offer a lower level Grade 1-2 walk today but please contact us prior to booking, alternatively you may opt to have a free day to yourself and for example explore Derwent Water on a boat cruise. 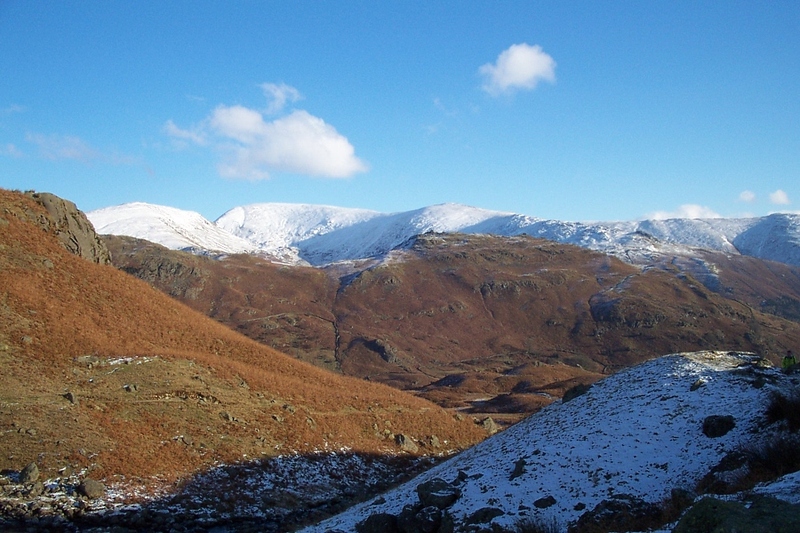 For tonight’s social evening, Country Adventures will organise meeting up for drinks and an optional meal in Keswick. Departure day. Check out is 10am but for anybody wishing to spend a little more time in the area there is an (optional) 3rd day of walking. The holiday finishes back in Keswick between 3-4pm. 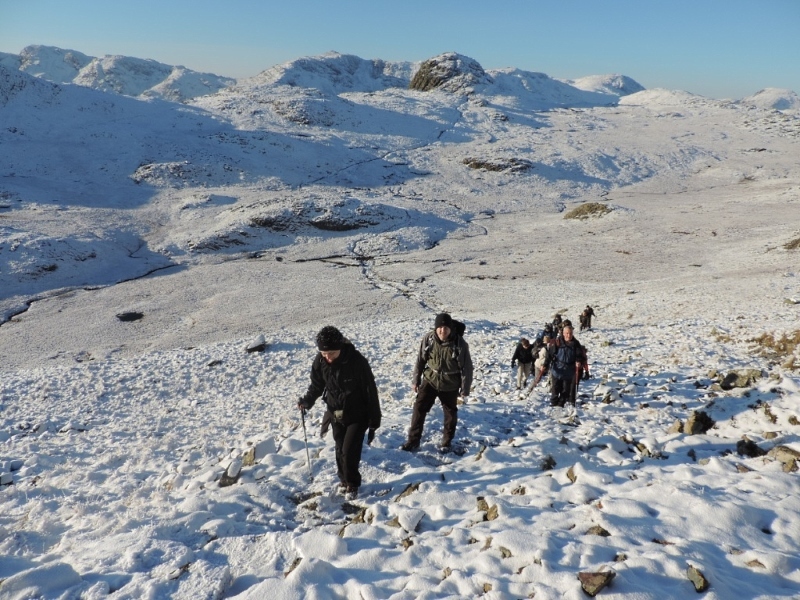 The optional accommodation for the Twixmas winter walking holiday is YHA Keswick, Lake District. Rooms are shared male and shared female bunkrooms and the package includes 3 nights bed with breakfast. Meals included during the holiday: All breakfasts (with YHA Keswick accommodation option). For the walk(s) please bring with you a packed lunch and refreshments. 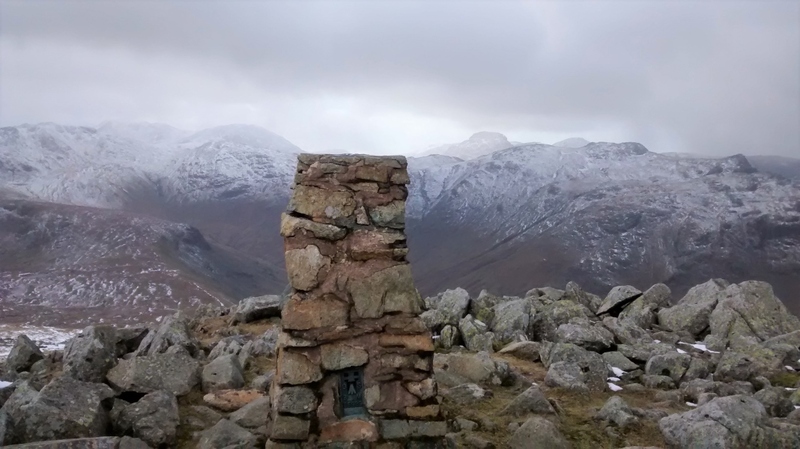 Occasionally on some guided walks (Grade 1 to 2 walks) we may pass a country inn or tea room where if we have time we can call in, however having a packed lunch with you gives the group the freedom to have lunch wherever we are on the walking route. YHA Keswick has a well equipped self catering kitchen with fridges and storage space to enable you to store snacks and packed lunch items if you wish to prepare your own packed lunches. Alternatively, packed lunches for the walks can be purchased from the hostel (approx. £6.25) or from the local convenience stores in Keswick. On Friday & Saturday evening we will go and eat in the town of Keswick (optional extra) where there are several restaurants to choose from. For guided walking tours that require transport from the meeting point to the start of the walk, we use a minibus or where necessary local transport. There is no extra charge for this, it is included in the tour price. Our walks are by no means designed to be endurance tests where everyone sets off at a blistering pace. 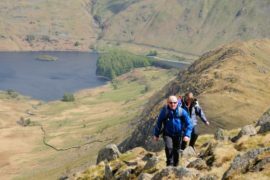 Far from it, it’s about a fine day in the hills in good company enjoying the best of fell walking with exceptional views but it is important to state that for everyone’s walking enjoyment walking does require a minimum level of fitness and stamina. Hill / Mountain walking experience is not essential as long as you have a reasonable level of fitness. For the higher level graded walks (i.e. 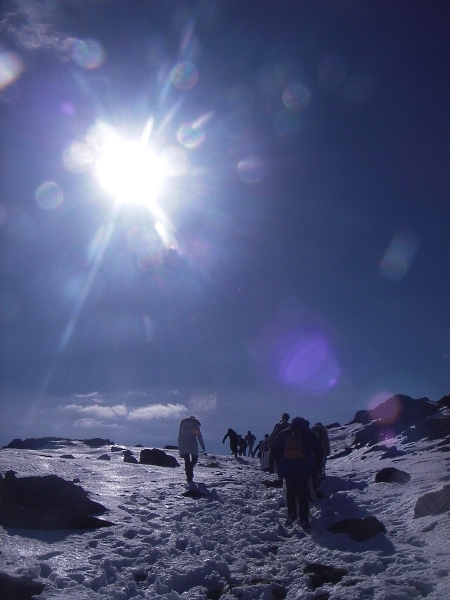 Challenging Grade) it is advisable that you are someone who enjoys regular cardio exercise or have experience of mountain walking and have the stamina/ leg strength in order to be better prepared for longer sections of uphill & downhill walking associated with higher mountain treks. 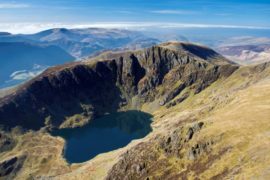 Grade 1 (Leisurely) Normally 5-8 miles, may include gentle ascents and descents of up to a total 1100ft of ascent and similar descent over a day’s walk. Easier scenic walking at lower altitudes along paths and tracks. Grade 2 (Moderate) Normally 6-10 miles on paths and tracks, between 800ft – 1700ft of total ascent and similar descent. Longer walks, on hills and moorland. Grade 3 (Moderate Mountain) Normally ranging from 6-10 miles, between 1700ft – 2600ft of ascent, similar descent. 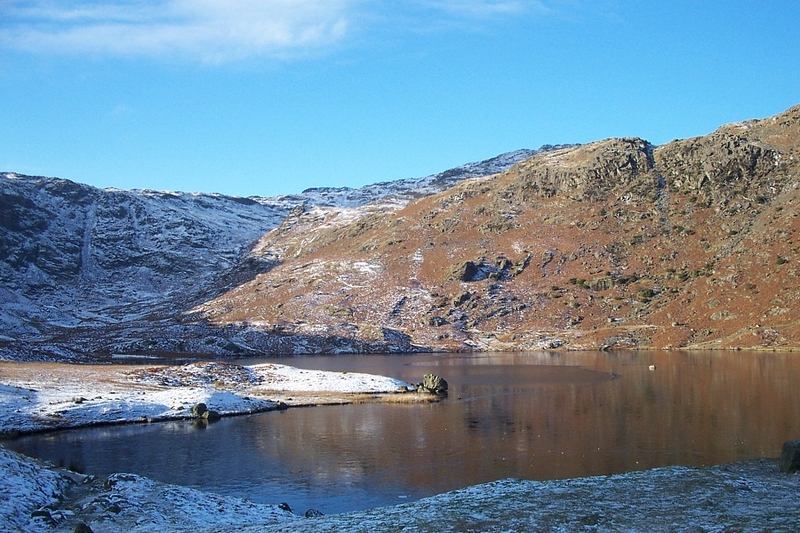 Longer walks, over higher ground with possibly steeper ups and downs on paths and tracks. 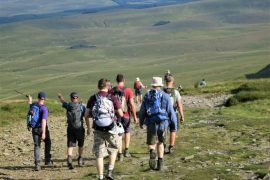 Grade 4 (Challenging) Normally ranging from 8-13 miles, between 1500ft – 3000+ft of ascent, similar descent, over undulating mountain terrain, walking at higher levels with steep ups and downs. Suitable for people with a good level of fitness. Good, comfortable walking boots with a cleated sole and good ankle support are essential. Warm, dry walking clothing. Unsuitable clothing includes Jeans or cotton tracksuit bottoms and cotton t-shirts (cotton is a poor insulating fabric and when wet it takes a long time to dry, which can lead to a rapid loss of body heat as well as being uncomfortable). A number of thin layers are better than one thick/ heavy jumper. We suggest a fleece for extra warmth especially when we stop on the hills for lunch. Hat and gloves (even in summer – any wind chill on the mountain tops will lead to cooler temperatures). Hot or cold drinks (i.e. a minimum of 2 litres of water). Plenty of food and drink for lunch and snacks. A rucksack large enough to carry it all in (20-30 litres), ideally with a waterproof liner. Thermos flask. 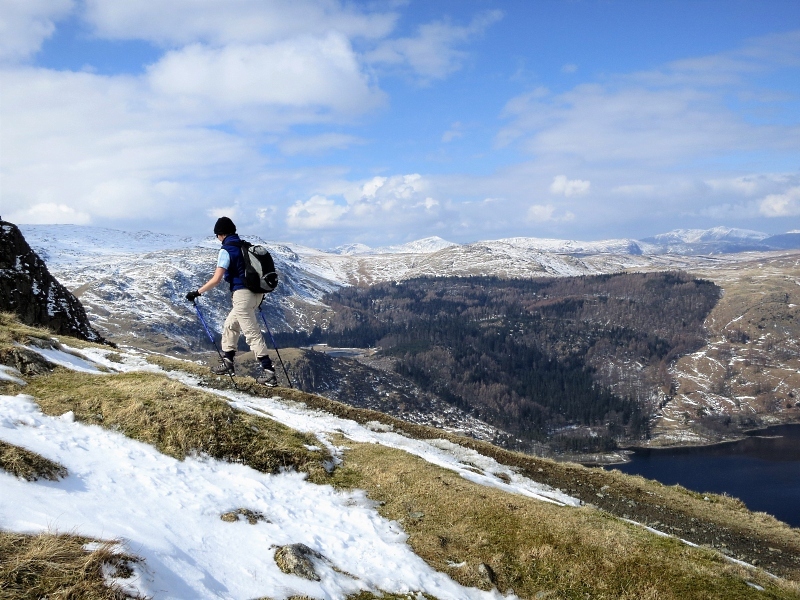 We recommend bringing warm drinks with you, as even on sunny days it can occasionally feel cooler, especially on the summits of the higher-level mountain walks. Walking poles (if you use them). A towel if staying at YHA Keswick. We want you to enjoy your time with Country Adventures and have the best possible adventure experience. Please be aware that if any participants are not properly equipped for the walk (i.e. with walking boots and waterproofs), at the guide’s discretion we reserve the right to not allow them on the walk for reasons of safety for both the individual and the group. If you need clarification any of the equipment requirements, please don’t hesitate to ask. Please ensure you give yourself plenty of time to get to the meeting point at the required time. The transport for our day walks will leave promptly at the stated time and due to the nature of scheduled tours, we are unable to provide refunds if unfortunately, you miss the departure time. Please meet at YHA Keswick, details will be included with your final booking confirmation. At Country Adventures we’re very proud that time after time our customers enjoy our walking weekends, holidays and adventure breaks. We thrive on customer feedback, it helps to ensure our trips continue to be the best they can be. We don’t edit the reviews, the only thing we do is proofread them and alter any typos, where necessary, to ensure they are easy to read for everyone. Another great holiday - interesting walks, good company and well organised. Thank you Joe! Another great Twixmas break & a chance to catch up with friends. Blown away by views (but almost literately) on the walk to Causey Pike. Everything planned so as to to make for a great experience. Just got home from the 2016 Twixmas walking break at Llangollen Whitewaters Hotel and feeling very satisfied with some challenging walks in good company. Very good hotel accommodation, good food, exercise and a few beers made for a perfect long weekend break. The weather was stunning too which gave excellent views from the hill tops. The thing that sets Country Adventures apart is the man, Joe, himself. His jovial personality and easy going chat makes for a great group dynamic and an enjoyable holiday. All walks are properly organised with safety in mind. Bag meals supplied, evening socials, camaraderie with no pressure. 5 stars because i can’t think of anything at fault with this trip. Looking forward to the next adventure. Just got home from the 2016 Twixmas walking break at Llangollen Whitewaters Hotel and feeling very satisfied with some challenging walks in good company. Very good hotel accommodation, good food, exercise and a few beers made for a perfect long weekend break. The weather was stunning too which gave excellent views from the hill tops. The thing that sets Country Adventures apart is the man, Joe, himself. His jovial personality and easy going chat makes for a great group dynamic and an enjoyable holiday. All walks are properly organised with safety in mind. Bag meals supplied, evening socials, camaraderie with no pressure. 5 stars because i can’t think of anything at fault with this trip. Looking forward to the next adventure. 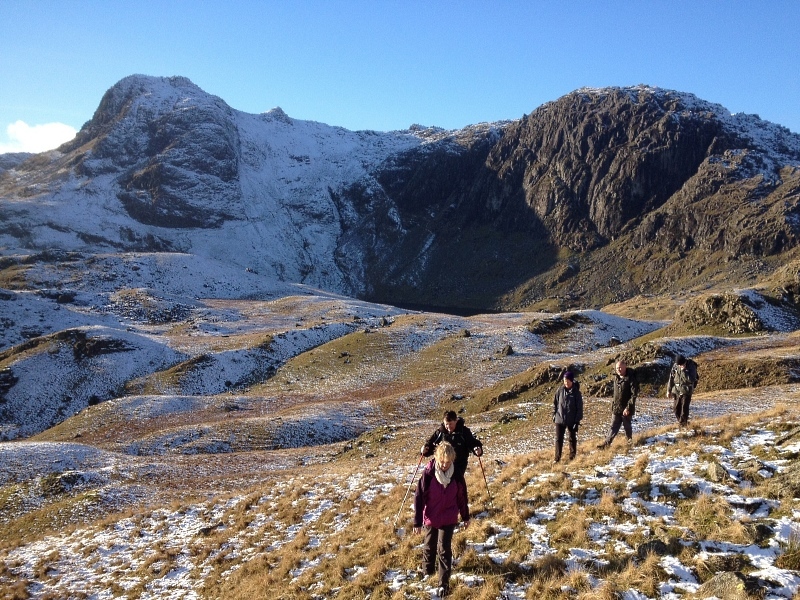 Another great Twixmas trip, good company, great walks & scenery. The snow was a bonus, haven’t tobogganed in years! 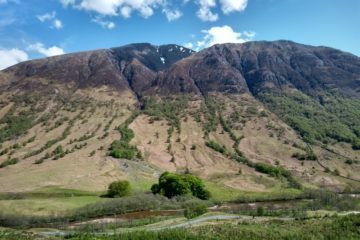 My first time on an organised walking holiday and found it a great experience. It was so nice to be able to relax in good company. I will be back for more. Thanks to you, Joe, and the other guides for your expert leadership, which contributed so much to the enjoyment at Elterwater.